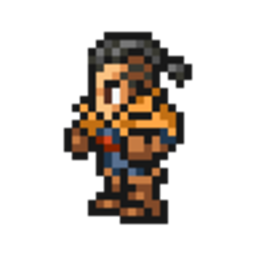 The adopted son of Thunder God Cid, Orran went on to serve at his father's side. His life takes a dramatic turn after he meets Ramza and Delita. Proficient with a variety of weapons and armor, with a focus on books and rods. Can use rare white magic and bard abilities, allowing access to a wide array of spells. Stop (FFT)(Orran) High chance to Stop all enemies. Restore a moderate amount of HP to one ally, and remove delay from their actions for one turn. Gain a small amount of Mind when a book is equipped. Gain a moderate amount of Mind when a book is equipped. Gain a large amount of Mind when a book is equipped. Increase white magic healing a small amount. Begin battle with Haste, and remove delay from the user's actions for three turns. Small chance for white magic abilities to restore a small amount of HP to all allies. Time Mage Sphere S. Lv.1 +2 DEF Complete the Black Mage Sphere. Devout Sphere S. Lv.1 +3 MND Complete the White Mage Sphere. Allegro con Moto Sphere S. Lv.1 Use 6★ Bard Abilities Use 5★ Bard Mote x1. Orran Legend Sphere S. Lv.1 +10 DEF Complete the Time Mage Sphere.